A market study, titled “RFID Blood Monitoring Systems Market - Global Industry Analysis, Size, Share, Growth, Trends and Forecast, 2013 - 2019”, has been recently released by Transparency Market Research (TMR). The report states that the global RFID blood monitoring systems market, which had a valuation of US$40.9 mn in 2012, will reach a valuation of US$174.2 mn in 2019, displaying a whopping 22.80% CAGR from 2013 to 2019. The report covers a detailed analysis of the market drivers, restraints, and opportunities of the global RFID blood monitoring systems market. The report includes an in-depth analysis of the four broad regional markets for RFID blood monitoring systems, namely North America, Asia Pacific, Europe, and Rest of the World.Radio frequency identification (RFID) is a state-of-the-art technology that uses electromagnetic fields for wireless transfer of information. In recent years, RFID technology has gained traction in the healthcare industry, mainly due to high consideration for patient safety and medical equipment management. In healthcare services, RFID blood freezers and refrigerators are important devices for storage, tracking, monitoring, and controlling inventory of blood and blood-related products in blood banks, hospitals, and other clinical settings.Increasing need for efficient management systems for the handling of blood and blood-related products and to reduce transfusion errors during medical processes has led to rapid adoption of RFID technology in the healthcare sector.In addition, increasing development of healthcare facilities, resulting in high volume of blood and blood-related products, has necessitated the use of technology-driven solutions such as RFID. Hospitals and blood banks are always on the lookout for solutions that would offer maximum patient safety, minimum blood transfusion errors, and minimal wastage of blood products. For such needs, the use of bar code and note-taking systems leaves room for error, for which RFID-based blood tracking solutions are best suited.Moreover, in emerging economies, privatization of healthcare infrastructure has led to a high number of modern service offerings across hospitals and other clinical settings. This has resulted in high-volume storage and handling of medical devices, blood, and blood-related products. Thus, RFID blood refrigerators and freezers are suitable for efficient pathology services and hospital admission. 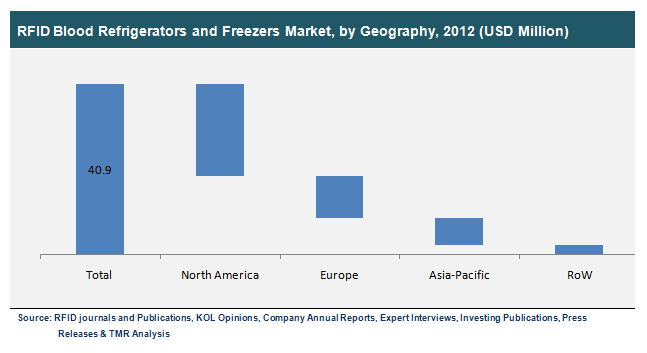 This has been advantageous for the manufacturers of RFID blood refrigerators and freezers. However, stringent compliance mandates at every stage of product development is a major reason for slow deployment of RFID-based tracking solutions. Nevertheless, increasing demand for blood products and provisions such as retrofitting of conventional blood refrigerators with RFID-enabled blood tracking systems will be beneficial for this market. Presently, the global RFID blood monitoring systems market is highly consolidated, with the presence of a handful of market participants. These include Biolog ID, Magellan Technologies, and Terso Solutions.